Today is the New York state primary. Regardless of the outcome, the election offers an opportunity to explore why two unconventional candidates — one a reality-television host and businessman, the other, a self-described socialist — are so popular. I want to start by directing your attention to a chart (above) from the U.S.Census Bureau. 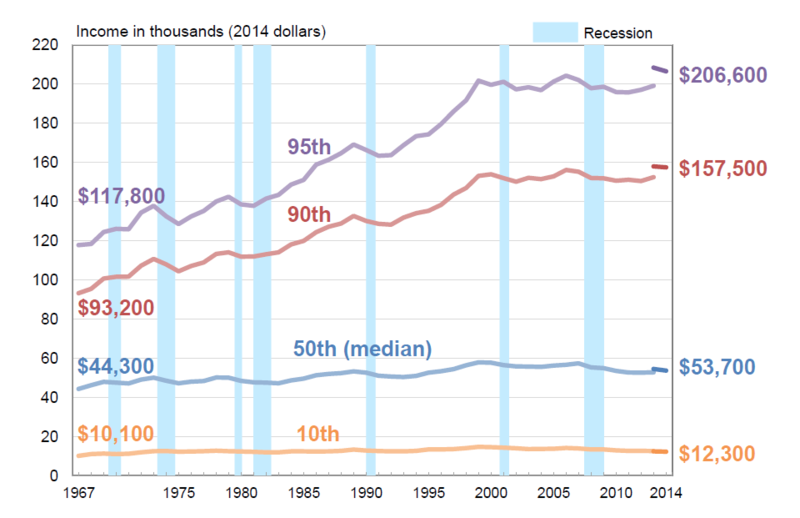 This shows real (inflation-adjusted) household income changes by percentile from 1967 to 2014. It’s pretty obvious how modest income gains have been during this period for the bottom half of the income distribution. Check the income for the 50th percentile (this is the median — half the households made more, half made less), which rose from $44,300 to $53,700 during this stretch. That works out to a gain of about 21 percent, or 0.40 percent a year. But there’s something even more interesting about this chart than the changes during the four-plus decades it covers. Consider the period from about 2000 to 2014, the last year for which there’s full data. Income is little changed for the upper 5 percent and 10 percent of households, and it declined for households in the lower half. In other words, for much of the population, household income gains for almost a half-century have gone nowhere — and for many households, income since the turn of the century has declined. Is it any wonder there’s so much anger directed at the political establishment? Historically, America’s policy and political debates have been about how the national income pie gets divided. These contests have been between capital and labor, urban and rural dwellers, consumers and retailers. But more recently almost all of the income gains have gone to a tiny percentage of households. A big swath of the electorate is fed up with this status quo and is demanding change — something they don’t expect to come from the leadership of either of the two major political parties. I don’t want to oversimplify too much, but this has to go a long way toward accounting for the appeal of Sanders and Trump. Low Productivity Driven By Less Competition?